Ride through Franklin Canyon up to the ridge along Cummings Skywy and descend on Crockett Blvd into Crockett. Cross over the Carquinez -Zampa Bridge into Vallejo and head east through town to Columbus Pkwy. Climb through the neighborhoods, continue east on Lake Herman Rd into Benicia and cross the Bencia-Martinez Bridge into Martinez. Exit Martinez on Arnold to Glacier and Vine Hill to Alhambra Ave and Franklin Canyon. Franklin Canyon Rd runs 4.4 miles from the SE end at Alhambra Ave to the NW end at Cummings Skywy between Hwy 4 and the Franklin Hills. The road begins with a short little bump from under the Muir trestle up to the wall of colorful murals. Franklin Canyon drops down through a small community with horse and cattle ranches, vineyards and residential farm houses and ranch type homes. The terrain up through the wooded canyon has minimal to no traffic with an average grade of 2%. The road does kick up to steeper grades of 6-8% for the last 0.4 mile to the top of Franklin Ridge at Cummings Skywy. Crockett Blvd drops us down into the town of Crockett; it’s a fun sweeping descent on very smooth pavement with fabulous views of the Zampa-Carquinez Bridge towers. Turn left on Pomona St towards the Zampa-Craquinez Bridge. The Carquinez Bridge Trail goes across the Zampa-Carquinez Bridge with fabulous views of San Pablo Bay and Carquinez Strait. Exit the Carquinez Bridge Trail onto Maritime Academy Dr and cross Sonoma Blvd to the residential neighborhood along 5th St. The turn on Magazine Dr leads up and over I-80 to the Beverly Hills neighborhood in Vallejo. The turn on Fulton Rd leads onto Glen Cove Rd; this road cuts across I-780 to the outskirts of town to Benicia Rd and Columbus Pkwy. Head north along the fringe of Vallejo on Columbus Pkwy for the next 2.8 miles. There is a 7-9.5% half mile climb on Columbus Pkwy; it begins at Springs Rd and continues up through some residential neighborhoods before descending to Lake Herman Rd. Lake Herman Rd extends 5.3 miles west in Vallejo to the east in Benicia; it’s a very quiet road with minimal traffic and great road conditions. The short climb takes you pass a rock quarry, old farms and ranches with views of grazing cattle dotted among the green grassy hillsides. Stop at Lake Herman Recreation Area for a quick pit stop. Take Industrial Way and climb up through the refinery on Park Rd to the Benicia-Martinez Bridge Trail. This scenic ride gets you out across two bridges with fabulous views of the Carquinez Strait and San Pablo Bay! 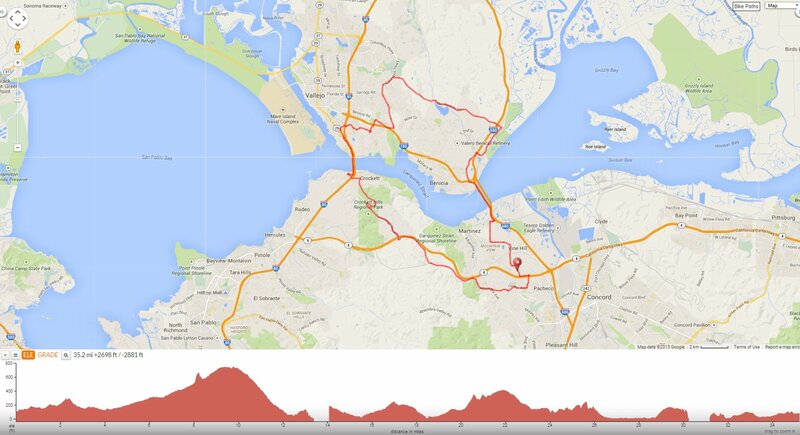 You’ll also enjoy the quiet run along Lake Herman Rd from Vallejo to Benicia! Weather: Brilliant sunshine and blue skies. Temps ranged from the low 50’s to the low 70’s with NW winds.